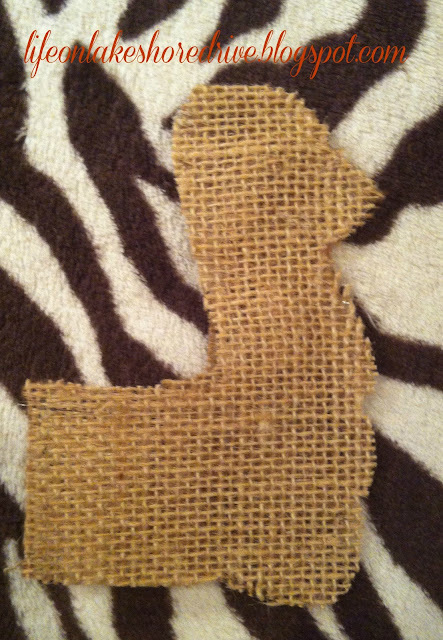 Since I am still working on Thanksgiving decor for my deck, I decided to take a school art project one step farther, and make a burlap turkey. If you missed that post you can see it here. It's the beginning steps for this project. 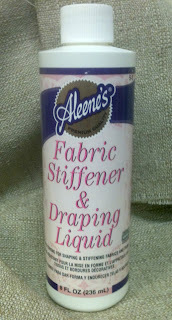 I used lots of Aleene's Fabric Stiffener on this project. 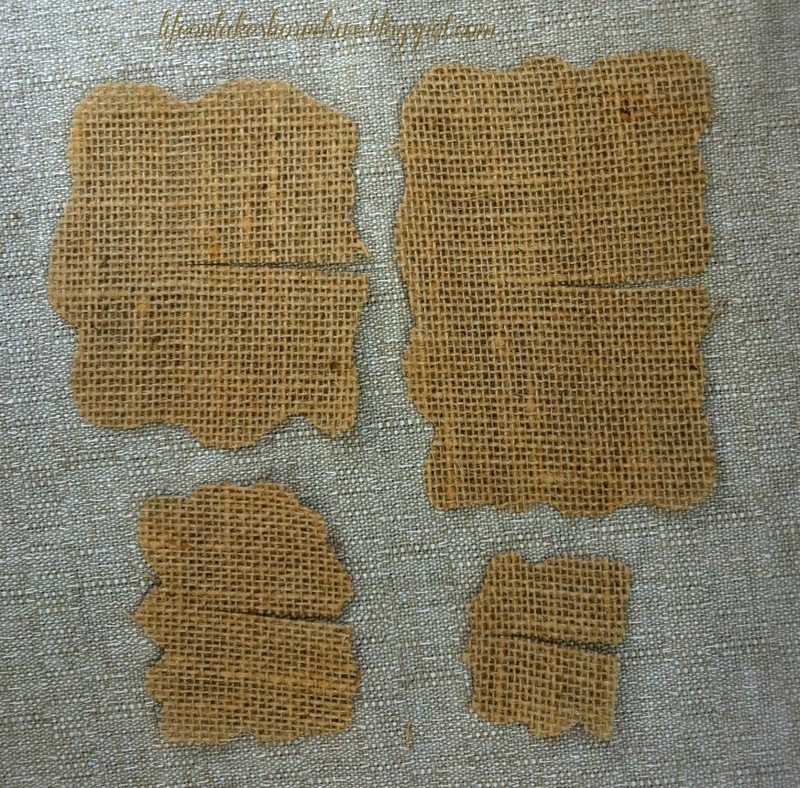 The first thing I did was to lay large squares of fabric on wax paper and brush the fabric stiffener on all the pieces. I used 3 pieces like the one below. I made each piece a little larger. 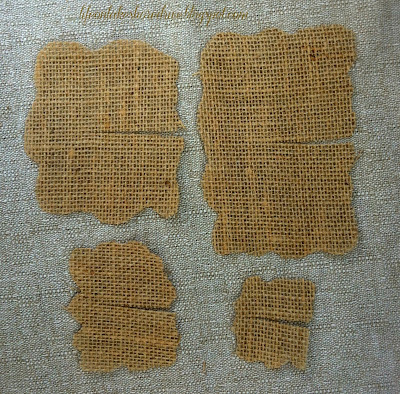 Not only does the stiffener help the fabric hold its shape, but it also does a great job of keeping the burlap from fraying. The photo below shows what the burlap looked like before I started. 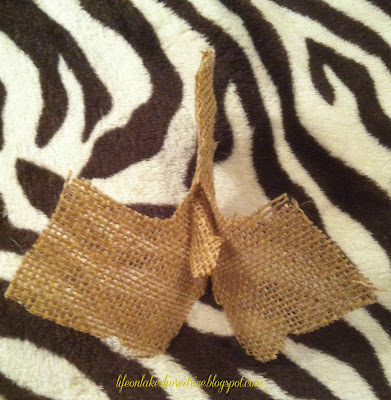 You can add the stiffener to the edges of your burlap and no more frayed edges. I stuffed a brown paper bag, and wrapped it in the burlap. 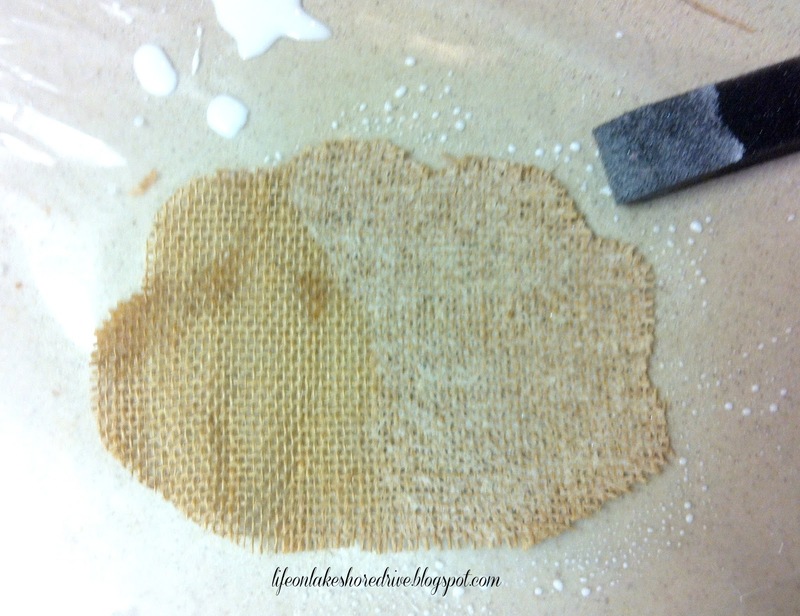 I did not use the fabric stiffener on this piece. I found that using a pipe cleaner was the fastest and easiest way to secure the bottom. I folded the edges in and glued them down with the glue gun. For the end that I added the feathers, I glued down the edges in small sections. I stuck a floral pin through the bag to keep it from sticking out. I glued the smallest piece first, and then glued the feathers to the it. 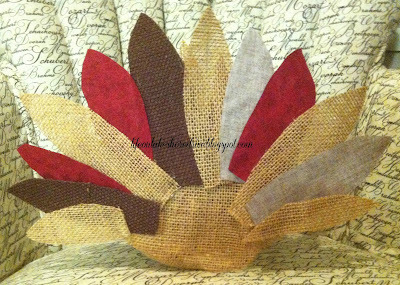 I added another layer of feathers and a larger piece of burlap. This helped to secure the feathers, and fan them out more. 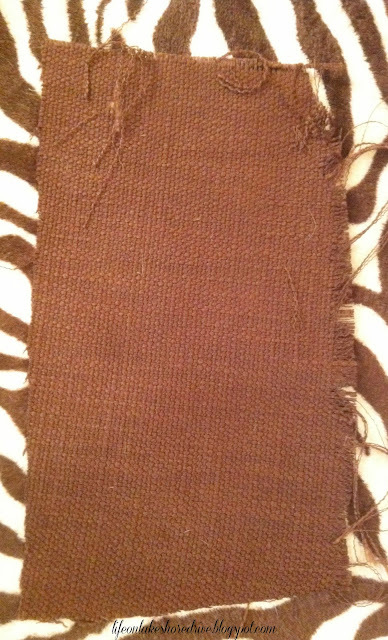 Last layer of feathers, and then I added the largest piece of burlap to cover up the feathers. I shared how I cut out the head and the pattern in the post for the paper turkey. 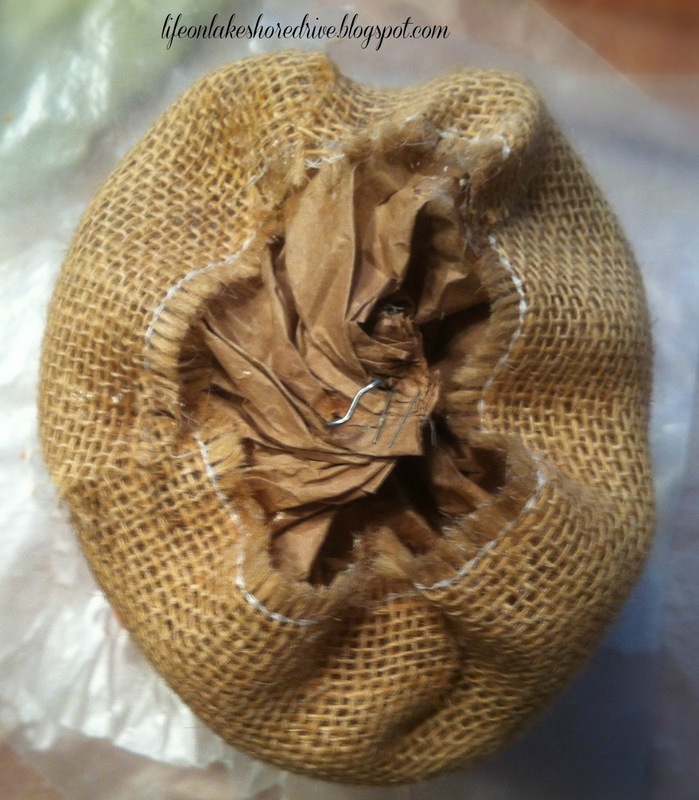 So the head of the turkey didn't look flat, I stuffed it with burlap scraps after hot gluing the edges together. I added the eyes and the red fabric, and then glued it to the turkey body. I also cut out a few brown feathers, and added them to the side of the turkey. The last step was to cut out several layers of feathers for the front. I slid each piece around the base of the turkey head and glued each piece. For the last layer, I added a red piece of fabric to extend the gobbler. All done! One of my major goals for my Thanksgiving Break is to change the layout of my blog so I can make my photos larger! Not looking forward to that task. LOL Thank you so much for visiting. I think the burlap turkey is adorable! I definitely like it better than the paper one, but it's great to be able to do craft projects in school. 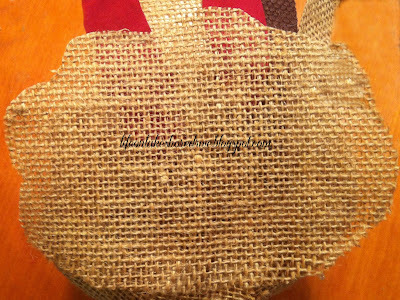 Wow that burlap one looks amazing! It looks like it should be a pierone! oh my goodness....Kathy this is so darn cute! That is awesome!! How creative! Thanks so much for coming out to the party at Clean and Scentsible. 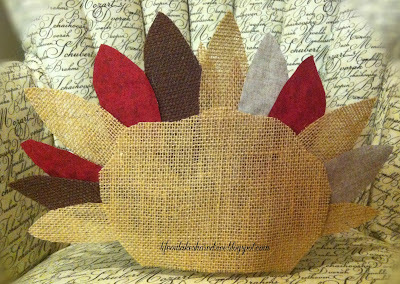 I will be featuring this on Thursday for my Thanksgiving Craft round up. Have a great week! This is so splendidly cute! 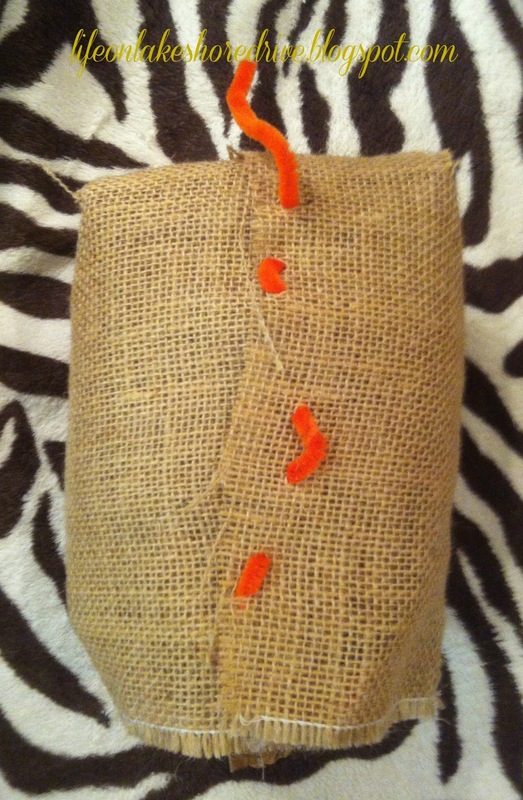 Never has burlap looked more festively sweet or friendly. Thank you very much for your lovely comment and for following my scrapbook blog, I sincerely appreciate it. How cute is this little gobbler!!! Thanks for the great tutorial too! You must be so creative in the classroom... because you sure are out!!!! 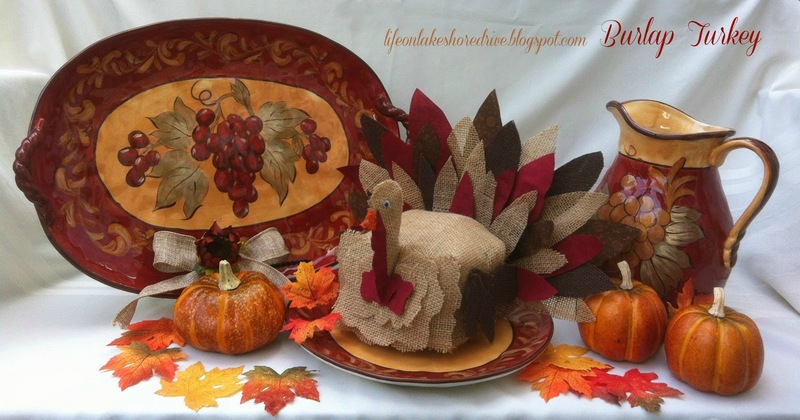 Thanks for sharing this fun Thanksgiving project!!!! Cute turkey!!! Newest follower via google + cute blog, I can't wait to read more! Oh my, this is so cute! Thanks for sharing the tutorial and I am now a follower. Love this! 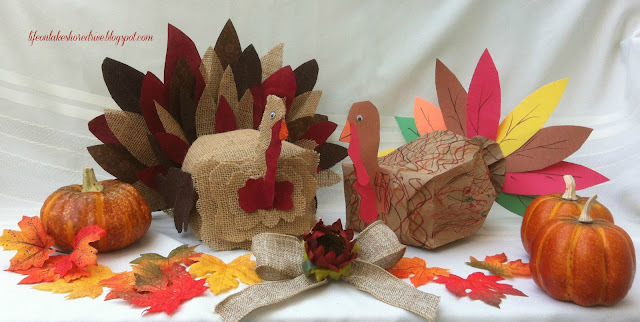 I've been looking for some T-Day decorative crafts I can do with my son- this is perfect! Come visit us at www.thesitsgirls.com! This is really incredible! So cute. Thanks for stopping by Pounds4Pennies. Please link up in our Pin It Wednesday party! We would love to have this at our LINKy. Oh, thank you so much! Can't wait to check out your blog and enter the giveaway. Thanks so much for stopping by, and the follow, too! 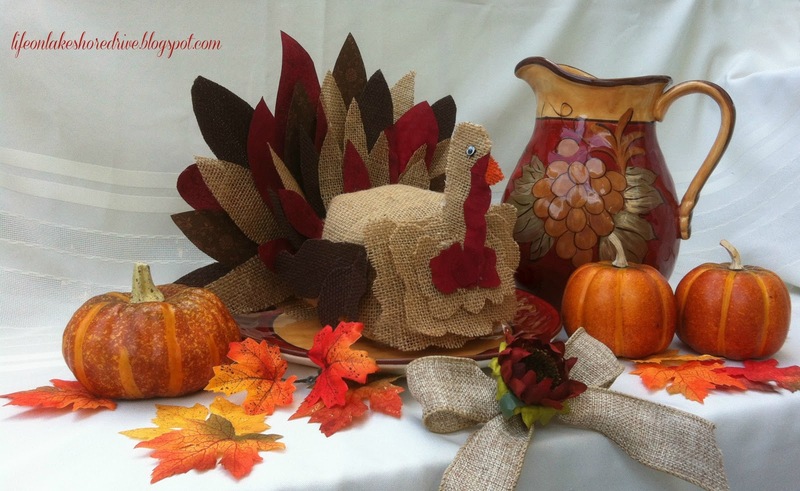 That's one cute "gobbler," Kathy...might try one w/ my grandkids! Pinned it for you! now that is one cute turkey! 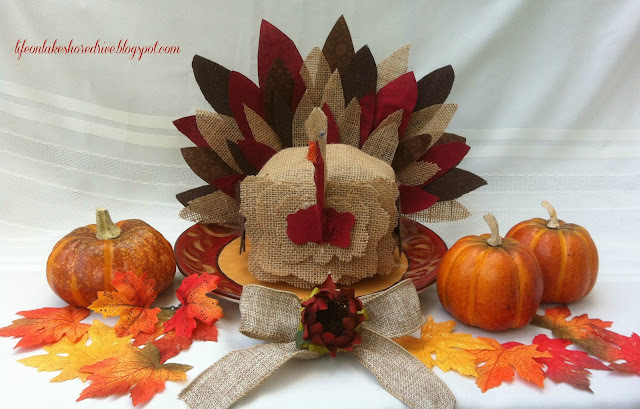 I love burlap and your burlap turkey! So cute! Thanks! I am a new follower of yours and looking forward to your blog! How adorable. I love the tail feathers and how full they are. Found you via Cheerios and Lattes. Cute little gobbler - love the burlap idea! Thanks so much for sharing on Busy Monday! I love this! 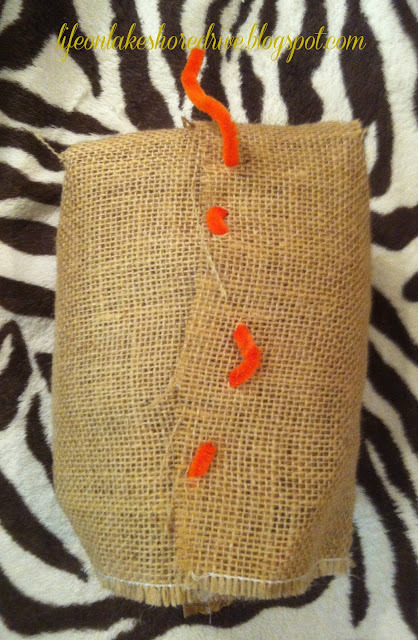 Burlap is my favorite fabric for projects.. this is such a clever way to use it! This is AWESOME!!! I'm pinning this, although I wouldn't have time to make one this year. 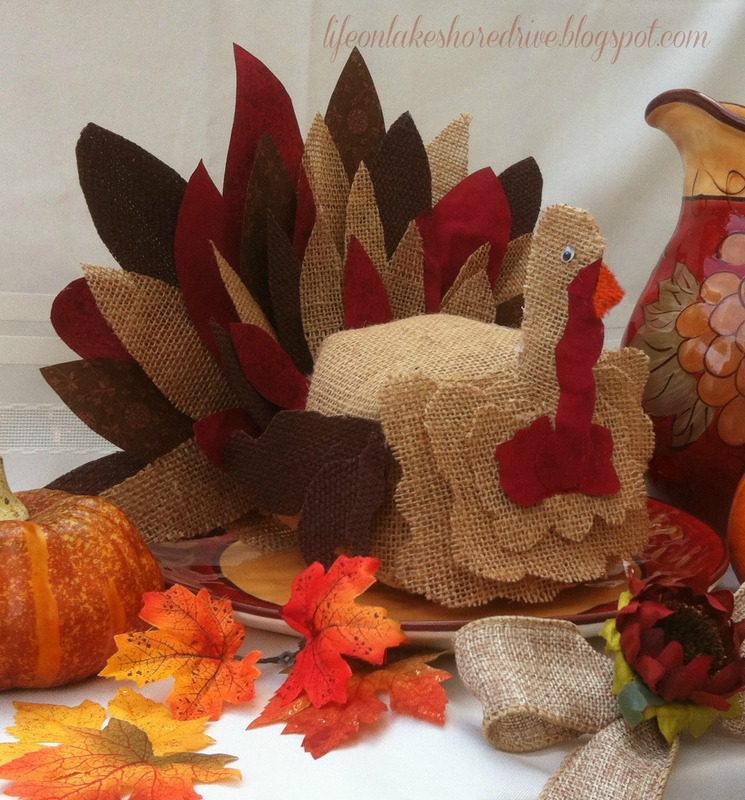 Your burlap turkey is so adorable - and it is great because unlike a real one I don't have to worry about how long to roast it before it dries out! Linking up with Super Handmade Sundays so please come over and say hi. Love your burlap turkey! Just adorable! Thanks so much for sharing Kathy on Simple & Sweet Fridays. That is the cutest turkey! That is one cute turkey! 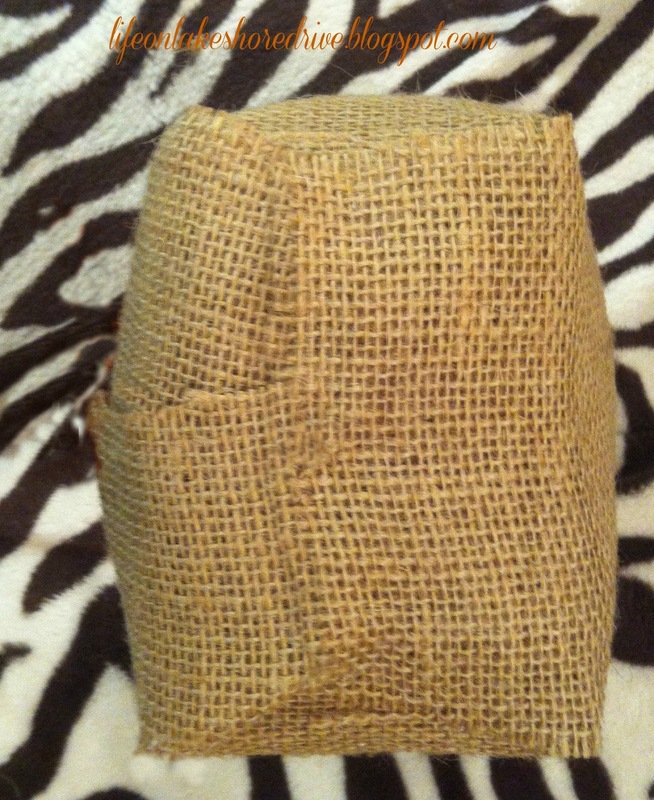 Don't you just love burlap! What a super cute project. I will be featuring this tonight at my Fall into Fall party that opens at 8pm EST. Please stop by and pick up an I've Been Featured button. Thanks. This is too cute! What a great idea! I've never seen that fabric stiffener, but it's so cool! I'll be trying that out SOON! What a great Thanksgiving decoration! Thank you so much, and thanks for the great party! Hope you are feeling better!! Thank you! I am burlap crazy here lately. LOL Thanks for the great party, and for stopping by!! Oh, thank you so much! 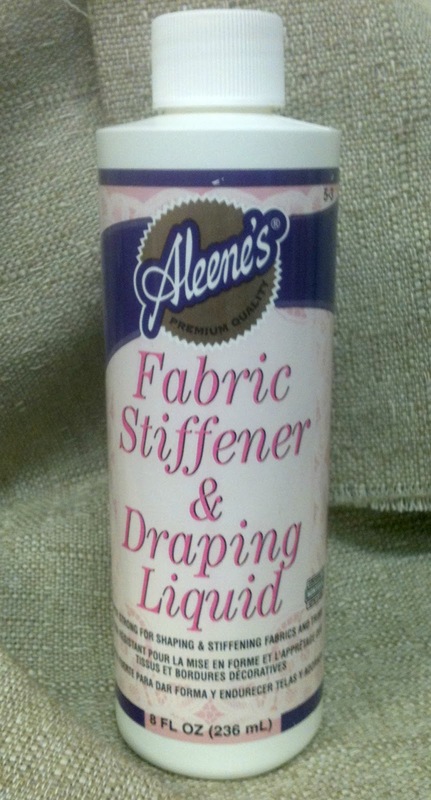 I love that fabric stiffener!! You can do so much with it. :) Thanks for the pin and for visiting. Both turkeys look amazing! Great work! 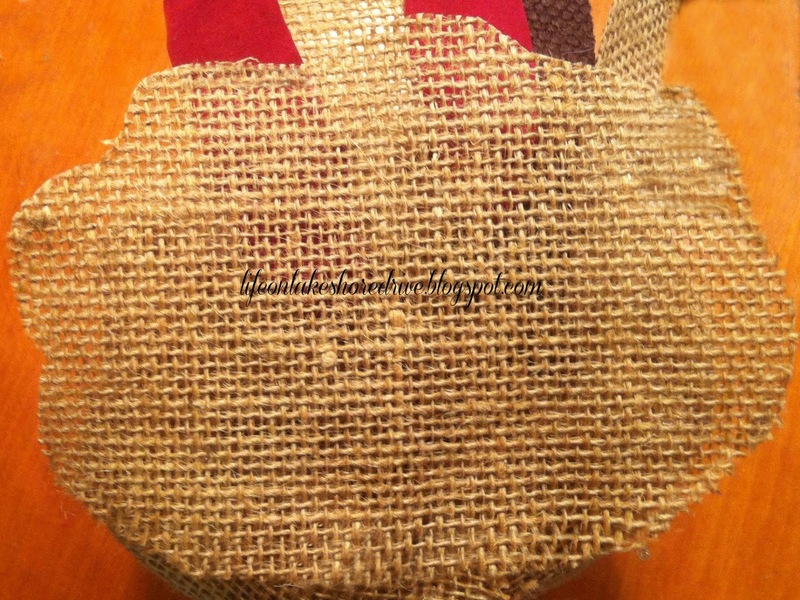 this is fabulous, love that burlap!! This is just too sweet! Adorable, really! Pinned, so perhaps I can try it one day:) Not sure if mine will be so pretty! Thanks for sharing at Foodies & Crafties Soirée. There are many online programs specially designed to let business owners payday loans las vegas no credit check attend business training courses per month free of cost. This free training is an opportunity to sense pulse of latest business trends in the market. Los Angeles is world famous for its payday loans toledo ohio business and living standards. It is the second biggest metropolitan city in United States. Life is large here. Form stadiums to shopping centers, everything is very big here. One thing is sure that nothing comes free in this world especially in financial market. No one wants to lose thousands of dollars for payday loans online no credit check someone’s business sake only. Consider personal or business level, money is lifeline for healthy growth. So, whether you are setting up new venture or want to enhance existing one, you need to assure payday loans illinois financial management. Most of newbie entrepreneurs find it a daunting business and often find it difficult to feed their venture with required funds whenever they need. So, here I am presenting a six step guide to take away all your confusion. Get instant loan approval for Online Payday Loans Alabama at PaydayAlabama. Apply for instant payday loans and get same day approved.